In 1791, President George Washington commissioned Peter L'Enfant to develop a plan for a new capital city. The architect envisioned a layout that was massive in scale for its time, with the intention "to leave room for that aggrandizement and embellishment which the increase of the wealth of the Nation will permit it to pursue at any period however remote." At its center was a 146-acre Mall, a long expanse of lawn spanning over two miles from east to west. Not until the capital's centennial celebration did city planners begin to appreciate the genius of his plan; today, the construction of new monuments and memorials prove out the wisdom of his concept. Over the years, the massive Mall has played host to numerous political, social, and religious demonstrations and gatherings, at times accommodating hundreds of thousands of participants. Several memorials border a serene reflecting pool in the Constitution Gardens across 14th Street on the west end of the Mall. The 555-foot obelisk of the Washington Monument is visible for miles around; the columned porch of the Lincoln Memorial houses a giant statue of Abraham Lincoln; wreathed columns surround a fountain pool at the World War II Memorial in tribute to all those who aided the war effort either abroad or at home; the Vietnam Veterans Memorial features two curved black granite walls engraved with the names of those who fought in the Vietnam War; and nineteen stainless steel soldiers stand guard in a field at the Korean War Veterans Memorial. Just to the south, overlooking the Tidal Basin, the domed rotunda of the Thomas Jefferson Memorial honors one of the nation's most respected Founders. Nearby, the Franklin Delano Roosevelt Memorial is highlighted by statues and water features intended to symbolize the many challenges of the tumultuous years during which FDR was president. Congress assembles in the Capitol across 3rd Street on the eastern end of the Mall. The neoclassical, domed building, typical of many government structures in the city, is fronted by another reflecting pool and the Peace Monument, the Ulysses S. Grant Memorial, and the Garfield Monument. The marble-columned Supreme Court and Library of Congress nestle behind the Capitol building. North of the Mall, near its western end, visitors will find the White House and various Executive Branch offices as well as the Federal Reserve Building. Numerous museums border Madison and Jefferson Drives to the north and south sides of the Mall, monuments to the United States' broad culture, history, and technology. Many of these museums, including the American History Museum, the Natural History Museum, the National Air and Space Museum, the National Museum of the American Indian, the National Portrait Gallery, and the American Art Museum, are a part of the Smithsonian Institution. 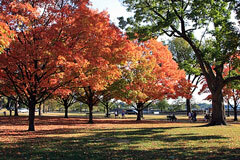 The National Gallery of Art houses one of the largest masterpiece collections in the world. The National Mall attracts over 25 million visitors annually, making it by far the most popular National Park in the United States. Altogether, the site is a rich collection of grand architecture, broad green lawns, and historic museums and memorials that pay tribute to a nation with a diverse and rich heritage. Washington-DC-Map.com. All rights reserved. About us.